1: The cold spot is located in the “warmer” hemisphere. 2: the colder Hemisphere is larger than the warmer hemisphere. 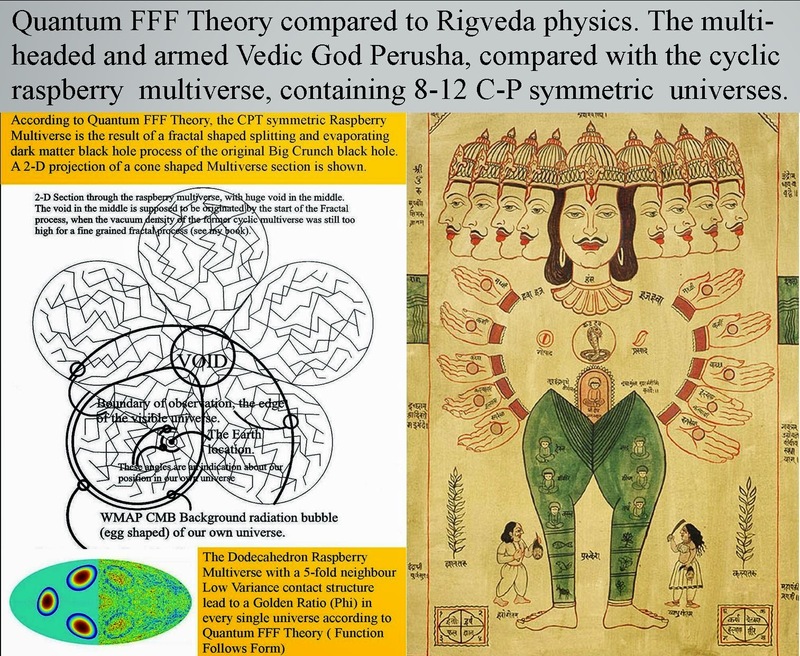 According to Q-FFF theory: Both elements tell us about our 3D position in the universal bubble of the raspberry multiverse see my topological image of the multiverse cross section. ﻿Explanation of the Anomalies in the final ESA Planck CMB map (left). 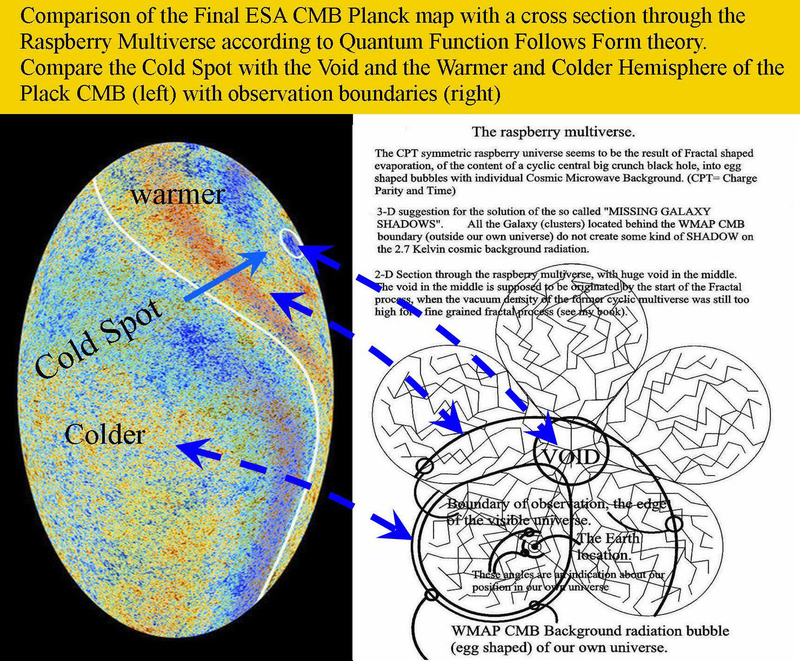 By comparison between the Final ESA CMB map with Raspberry Multiverse (right) effects for the cold spot- Void relation and the asymmetric light patterns (warm and colder) of both halves of the CMB universe. 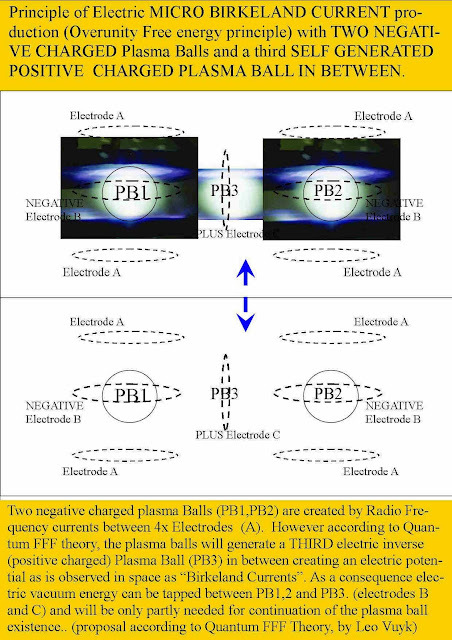 see Esa presentation and the Quantum FFF model. "All the Galaxy clusters located behind the WMAP CMB boundary do not show a so called CMB shadow!! 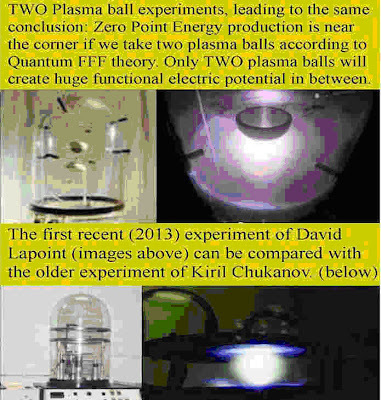 also called "Sunyaev- Zeldovich" effect. 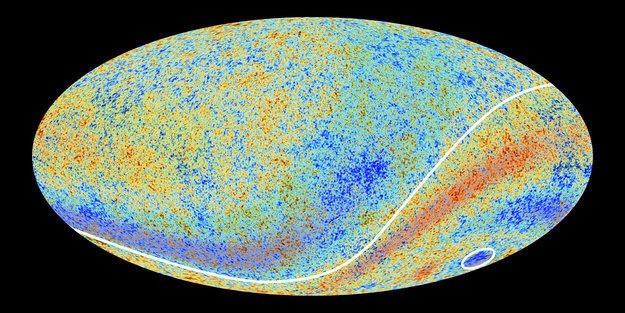 "One of the most surprising findings is that the fluctuations in the CMB temperatures at large angular scales do not match those predicted by the standard model – their signals are not as strong as expected from the smaller scale structure revealed by Planck. 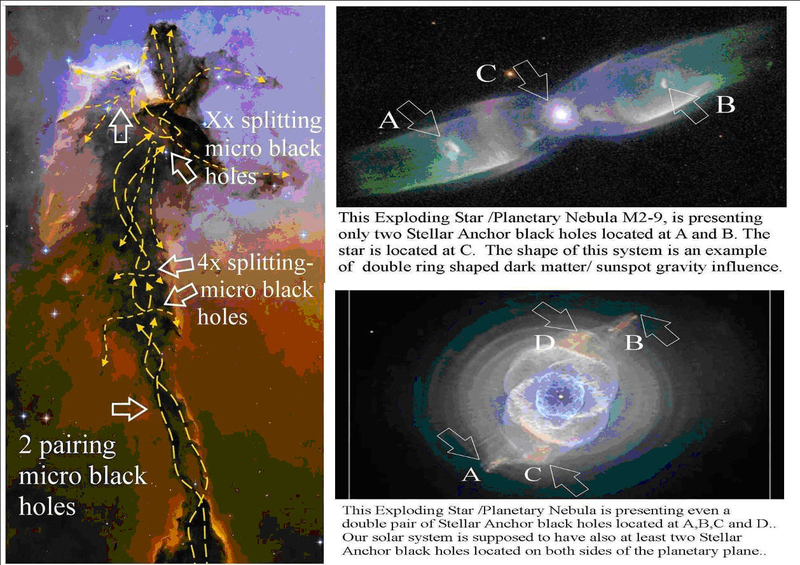 “Our ultimate goal would be to construct a new model that predicts the anomalies and links them together. But these are early days; so far, we don’t know whether this is possible and what type of new physics might be needed. And that’s exciting,” says Professor Efstathiou. " Other Multiverse suggestions based on Cold spot interpretation. 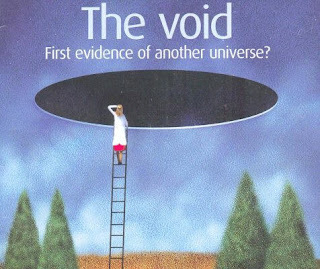 A theory based on the multiverse aspect of the string theory claims that the dynamic effect of matter and gravity would have weeded out the majority of string vacuums, leaving only our patch and close neighbours in the string landscape. A calculation shows that interaction between neighbouring patches in early epoch would leave the universes in an entangled state linking them together even when their separation is space-like (meaning they cannot interact with each other in the usual way). It predicts that pushing and squeezing between the patches will produce voids on the scales of about 1/2 billion light year. 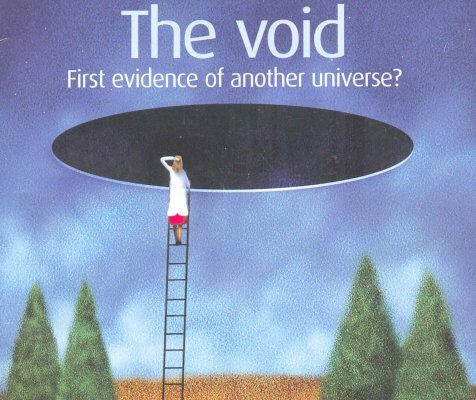 The alignment in the lower multipoles is the byproduct of such interaction, which squeezes our universe on one side, perhaps shaped it like a pancake. 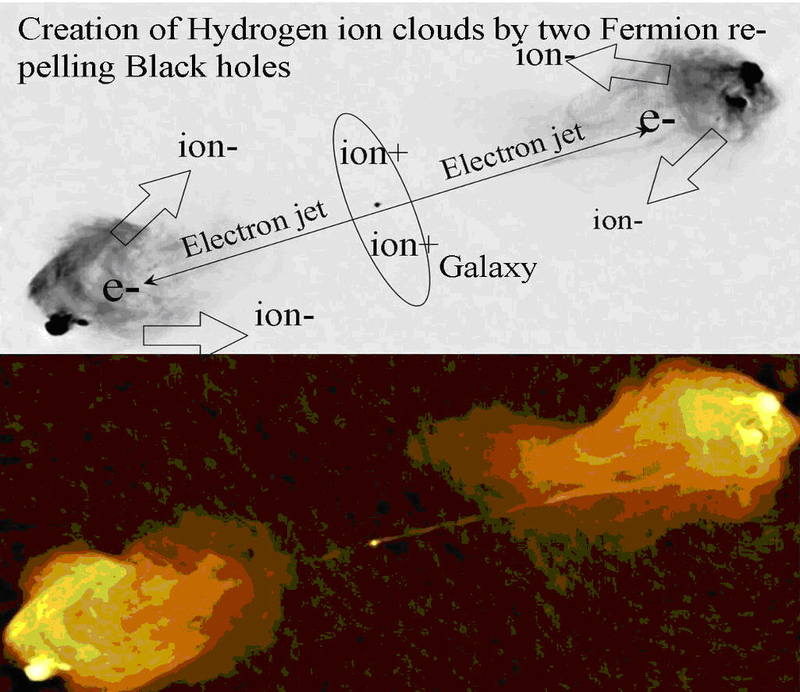 This theory may point us to the first glance of another universe after all kinds of speculation in science fictions (Figure 02-09c). 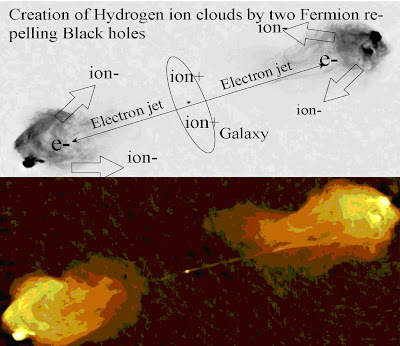 At the universal scale we also observe Birkeland current systems between Fermion repelling "Dark Matter Black Hole Systems" just as Plasma Balls in the Lab. seem so be.